CRISPR/Cas9 gene therapy is an emerging gene-editing tool that needs to be highlighted and elucidated through research. This form of gene therapy is an extraordinary approach in medicine since certain diseases are regarded as incurable and are merely managed and controlled through medications utilized long term with potentially harmful side effects that need to be avoided and managed, in addition to the repeated monitoring plan required for both the disease and medications. However, CRISPR/Cas9 has the implication to cure diseases that are considered incurable. This gene-editing technique would serve as a miraculous method for disease curability in clinical setting in the future; therefore, CRISPR/Cas9 requires further researching to emphasize its importance through supporting the findings in current preclinical trials and potential subsequent clinical trials. The purpose of this research is to show the most impactful publications through a bibliometric analysis of the top 50 most-cited papers regarding the topic of CRISPR/Cas9 gene-editing tool. The most-cited research articles relative to CRISPR/Cas9 were collected using Scopus through July 2018. Scopus is one of the largest databases which show abstracts and citations. The literature is peer reviewed. The database enables the search from a variety of fields and areas of discipline. We used Scopus search tool to identify indexed articles. Articles were identified by searching for titles with the term “CRISPR Cas9” in the search tool to retrieve the researches relative to the topic. The order of the most-cited papers was conducted by categorizing the studies in an ordinal manner from the most cited to the least-cited studies; in addition, the studies were stratified by selecting the top fifty most-cited papers with the title “CRISPR Cas9” among the 2230 researches. The studies retrieved were assorted according to the title, number of citations, year of publication, journal, first authors, subject area, in addition to country of origin. The papers selected among the top 50 most-cited papers must be published between 2011 and 2017; in addition, the type of papers that were specifically selected for retrieval was original articles, review articles, systematic reviews, and letters. A number of 2230 research papers regarding CRISPR Cas9 were retrieved through the utilization of the search tool. 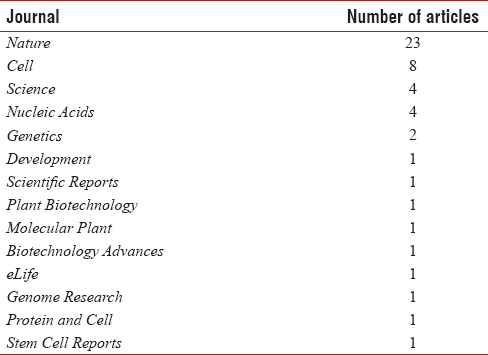 The top 50 studies relative to CRISPR Cas9 are presented in [Table 1]. The top 50 studies were published between 2013 and 2016. [Table 2] shows the frequency distribution between the years of publication for the top 50 research papers. Forty-two percent of the papers from the top 50 most-cited papers were published in 2014. The total citation count for each of the top 50 studies ranged from 183 to 1824, and the mean number of citations was 420. The first five articles were cited more than 1000 times and the remainders were cited more than 100 times. [Table 3] shows the papers that are cited more than 1000 times. The journals in which the top 50 research papers were published are presented in [Table 4]. The journal Nature has published the most studies relevant to CRISPR Cas9 with a total of 23 studies, Cell with eight studies, followed by Science and Nucleic Acids with four studies published and Genetics with two. Development, Scientific Reports, Plant Biotechnology, Molecular, Biotechnology Advances, eLife, Genome Research, Protein and Cell, Stem Cell Reports have each published one research paper on CRISPR Cas9. The types of document utilized among the top 50 studies on CRISPR Cas9 were articles, reviews, and letters. Articles comprised 45 (90%) of the top 50 most-cited papers. Reviews comprised 4 (8%), and one publication was implemented in the form of a letter (2%). [Table 5] shows the total number of studies for each document type. Authors with first author publications are presented. Ran F. A., Shalem O., Kleinstiver B. P., Gratz S. J., Doench J. G. have two publications each within the top 50 most-cited papers on CRISPR/Cas9. 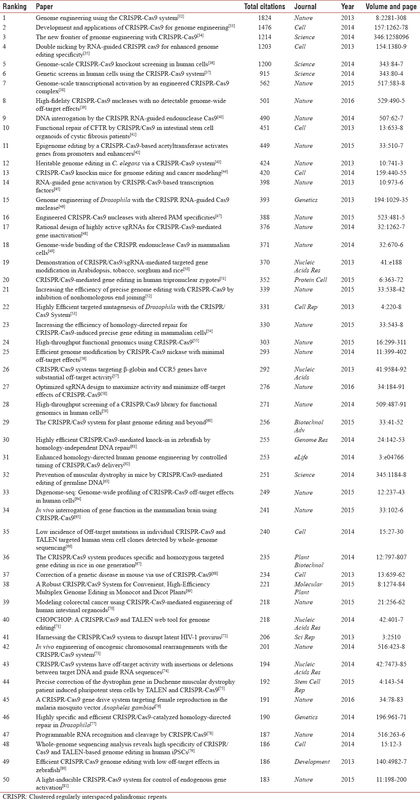 In our study, we summarize the top 50 most-cited research papers relative to CRISPR/Cas9. We used a bibliometric approach to demonstrate and analyze the papers to showcase not merely the quality but also the quantity of the papers in a comprehensive, measurable interpretation for written publications. We believe that a bibliometric analysis is suited and is applicable to our study, considering our focus regarding a numerical order of a group of studies relative to CRISPR/Cas9. Through our search, we have managed to retrieve a total number of 2230 regarding CRISPR/Cas9. Not surprisingly, the number of studies retrieved is abundant; we believe that this accounts for the novelty of this form of gene-editing technique that gained consideration in 2011 following its investigation and biomedical analysis which proceeded in the collaboration of multiple scientists and geneticists in the exploration of CRISPR/Cas9., Through further analysis, we narrowed the studies by designating the articles according to the number of citations. We distinguished that the initial five studies were cited more than 1000 times;,,,, in contrast, the remaining 45 studies were cited more than 100 times. The citation rate for each study varied, and there seems to be a significant difference between citation counts. The observed difference is noticed between the 6th paper in comparison to the 7th paper from the top 50 articles. In relation to time, the citation rate appears to increase with previous articles such as those published in 2013 as well as 2014. Authors with first author mentioning within the top 50 most-cited papers include Ran et al., with two papers published within the list regarding CRISPR/Cas9., In addition, the author's publications are within the top 10 most-cited papers ranking 1st and 4th on the list, with each article having 1824 and 1202 citations, respectively. Shalem et al., another author with two publications on CRISPR/Cas9 in the top 50 most-cited papers. Similarly, Shalem et al. 's paper “Genome-scale CRISPR-Cas9 knockout screening in human cells” ranked 5th on the top 50 list with 1197 citations. The author's second paper titled “High-throughput functional genomics using CRISPR-Cas9” was the 24th most-cited paper among the list. It managed to be cited 302 times. Kleinstiver et al. have two papers., Their paper was 8th on the list with 499 citations, in addition to their second paper which has 388 citations that did not seem to differ significantly from the other paper published by the author. His second paper was ranked 16th. Moreover, the papers titled “Genome engineering of Drosophila with the CRISPR RNA-guided Cas9 nuclease” and “Highly specific and efficient CRISPR/Cas9-catalyzed homology-directed repair in Drosophila” were both published by author Gratz et al., whom their two publications managed to be cited 392 and 190 times, respectively. Finally, Doench et al. also have two publications regarding CRISPR/Cas9., Their papers are 17th and 27th on the list with 376 and 275 citations, respectively. The top 50 most-citied studies were published between 2013 and 2016. Most of the studies within the top 50 most-cited papers were published in 2014 (42%). We believe that this in part due to the introduction of CRISPR/Cas9 gene therapy in the field of biotechnology, as well as the demonstration of its relevance and abundant role through the implementation of CRISPR/Cas9 gene editing in animal and plant models, that thereafter, have caused a rise in questioning and produced ideations that led to further investigation and amplification of its importance in treating genetically linked disorders.,,, Among the top 50 studies, the majority of the papers that were published in 2013 were conducted on animal and plant models. The nonhuman models in which gene alteration was observed were mice,,,, nematodes, Drosophila,, and zebrafish, as well as plant models such as Arabidopsis, tobacco plant, sorghum, and rice. As aforementioned, the diseases that have the potential for treatment are genetically linked. Among the top 50 most-cited studies, the diseases that were stated include CF, cancer, muscular dystrophy, cataracts, and HIV. Cancer treatment using CRISPR/Cas9 was observed in animal models in vivo that led to reproducibility of in vitro human oncogenic analysis which showed promising results.,, On the other hand, cataract observed in mice had a genetic link to the CRYGC gene that further led to the investigation of the integration of CRISPR/Cas9 for disease reversal. Moreover, HIV-1in vitro analysis using CRISPR/Cas9 has also been demonstrated and has shown to successfully manage the disruption of HIV-1 expression through the incorporation of CRISPR/Cas9. Muscular dystrophy is a disorder that is reputed to be incurable. However, in a recent study which is obtainable within the top 50 list, it showcased a connection between CRISPR/Cas9 gene editing and the prevention of DMD in vivo animal model. The study concluded that there is potential for a preventative approach in using CRISPR/Cas9 in DMD in humans. CF is linked to CFTR protein, which is required to be genetically expressed to prevent disease manifestations. In CF, this portion is defected which would ultimately lead to CF. The role of CRISPR/Cas9 in CF was demonstrated that the mutation in the protein was successfully corrected using the CRISPR/Cas9 system in vitro investigation through human oncogenic analyses. Through our evaluation of the top 50 most-cited papers, it is apparent that preclinical trials in nonhuman models as well as human in vitro genome analysis have proven that CRISPR/Cas9 is effective in altering the genetic coding of multiple diseases which indicates the curability of those diseases; therefore, CRISPR/Cas9 gene therapy has the potential for clinical trial conduction in the future due to the promising outcomes seen in both in vivo and in vitro analyses. CRISPR/Cas9 gene therapy has come along way since the idea of DNA alteration has been hypothesized in the 1970s. The immense research in terms of gene editing has been showing a promising future for multiple conditions that weigh heavily from a psychological and physical standpoint, in addition to an economic perspective. The top 50 most-cited papers are pivotal to the rise of CRISPR/Cas9 gene therapy as they aid and support the performance of this method of gene alteration; in addition, they add value to this scope of medicine by their implementation of CRISPR/Cas9 gene altering tool on animal models which showed successful and efficient outcomes.,,, In addition, the most valuable supportive measure of the utilization of CRISPR/Cas9 that would support its endorsement in the future on humans is its implementation through in vitro human genome analyses., The citation count for the top 50 papers is steadily and continuously increasing, which is indicative of CRISPR/Cas9 gene therapy's positive prominence in the past 5 years. It is evident from the literature search that the future of CRISPR Cas9 is promising as demonstrated by the highly impactful studies in the topic with high citation counts in a relatively short period after publication. With its potential to treat a wide array of diseases and conditions, it is safe to say that research on this topic will improve and increase in prospective advances in biomedical technology. Rogers on DNA Replacement. Cited by New Scientist Magazine. Rogers S, New Scientist; 1970. p. 194. Friedmann T, Roblin R. Gene therapy for human genetic disease? Science 1972;175:949-55. First Gene Therapy Trial by the National Institute of Health. Available from: https://www.genome.gov/10000521/1995-release- first-human-gene-therapy-results. [Last accessed on 2018 Jun 16]. Tani J, Faustine B, Sufian JT. Updates on current advances in gene therapy. West Indian Med J 2011;60:188-94. Gonçalves GA, Paiva RM. Gene therapy: Advances, challenges and perspectives. Einstein (Sao Paulo) 2017;15:369-75. Sorek R, Lawrence CM, Wiedenheft B. CRISPR-mediated adaptive immune systems in bacteria and Archaea. Annu Rev Biochem 2013;82:237-66. Westra ER, Swarts DC, Staals RH, Jore MM, Brouns SJ, van der Oost J, et al. The CRISPRs, they are a-changin': How prokaryotes generate adaptive immunity. Annu Rev Genet 2012;46:311-39. Jiang F, Doudna JA. CRISPR-Cas9 structures and mechanisms. Annu Rev Biophys 2017;46:505-29. Redman M, King A, Watson C, King D. What is CRISPR/Cas9? Arch Dis Child Educ Pract Ed 2016;101:213-5. Williams BO, Warman ML. CRISPR/CAS9 technologies. J Bone Miner Res 2017;32:883-8. Le C, Zhang F. Genome engineering using CRISPR-Cas9 system. Chromosomal Mutagenesis. New York, NY: Humana Press; 2015. p. 197-217. Pellagatti A, Dolatshad H, Valletta S, Boultwood J. Application of CRISPR/Cas9 genome editing to the study and treatment of disease. Arch Toxicol 2015;89:1023-34. Jo YI, Suresh B, Kim H, Ramakrishna S. CRISPR/Cas9 system as an innovative genetic engineering tool: Enhancements in sequence specificity and delivery methods. Biochim Biophys Acta 2015;1856:234-43. Hille F, Charpentier E. CRISPR-cas: Biology, mechanisms and relevance. Philos Trans R Soc Lond B Biol Sci 2016;371:20150496. Shrock E, Güell M. CRISPR in animals and animal models. Prog Mol Biol Transl Sci 2017;152:95-114. Yin H, Xue W, Chen S, Bogorad RL, Benedetti E, Grompe M, et al. Genome editing with cas9 in adult mice corrects a disease mutation and phenotype. Nat Biotechnol 2014;32:551-3. Castillo A. Gene editing using CRISPR-cas9 for the treatment of lung cancer. Colomb Med (Cali) 2016;47:178-80. Omer L, Hudson EA, Zheng S, Hoying JB, Shan Y, Boyd NL, et al. CRISPR correction of a homozygous low-density lipoprotein receptor mutation in familial hypercholesterolemia induced pluripotent stem cells. Hepatol Commun 2017;1:886-98. Bengtsson NE, Hall JK, Odom GL, Phelps MP, Andrus CR, Hawkins RD, et al. Corrigendum: Muscle-specific CRISPR/Cas9 dystrophin gene editing ameliorates pathophysiology in a mouse model for Duchenne muscular dystrophy. Nat Commun 2017;8:16007. Mendell JR, Rodino-Klapac LR. Duchenne muscular dystrophy: CRISPR/Cas9 treatment. Cell Res 2016;26:513-4. Sanz DJ, Hollywood JA, Scallan MF, Harrison PT. Cas9/gRNA targeted excision of cystic fibrosis-causing deep-intronic splicing mutations restores normal splicing of CFTR mRNA. PLoS One 2017;12:e0184009. Canver MC, Smith EC, Sher F, Pinello L, Sanjana NE, Shalem O, et al. BCL11A enhancer dissection by cas9-mediated in situ saturating mutagenesis. Nature 2015;527:192-7. Xie F, Ye L, Chang JC, Beyer AI, Wang J, Muench MO, et al. Seamless gene correction of β-thalassemia mutations in patient-specific iPSCs using CRISPR/Cas9 and PiggyBac. Genome Res 2014;24:1526-33. Hu W, Kaminski R, Yang F, Zhang Y, Cosentino L, Li F, et al. RNA-directed gene editing specifically eradicates latent and prevents new HIV-1 infection. Proc Natl Acad Sci U S A 2014;111:11461-6. Ophinni Y, Inoue M, Kotaki T, Kameoka M. CRISPR/Cas9 system targeting regulatory genes of HIV-1 inhibits viral replication in infected T-cell cultures. Sci Rep 2018;8:7784. Li H, Sheng C, Wang S, Yang L, Liang Y, Huang Y, et al. Removal of integrated hepatitis B virus DNA using CRISPR-cas9. Front Cell Infect Microbiol 2017;7:91. Zhang F. CRISPR-cas9: Prospects and challenges. Hum Gene Ther 2015;26:409-10. Sun L, Lutz BM, Tao YX. The CRISPR/Cas9 system for gene editing and its potential application in pain research. Transl Perioper Pain Med 2016;1:22-33. Ding Y, Li H, Chen LL, Xie K. Recent advances in genome editing using CRISPR/Cas9. Front Plant Sci 2016;7:703. Ratan ZA, Son YJ, Haidere MF, Uddin BM, Yusuf MA, Zaman SB, et al. CRISPR-cas9: A promising genetic engineering approach in cancer research. Ther Adv Med Oncol 2018;10:1758834018755089. Ran FA, Hsu PD, Wright J, Agarwala V, Scott DA, Zhang F, et al. Genome engineering using the CRISPR-cas9 system. Nat Protoc 2013;8:2281-308. Hsu PD, Lander ES, Zhang F. Development and applications of CRISPR-cas9 for genome engineering. Cell 2014;157:1262-78. Doudna JA, Charpentier E. Genome editing. The new frontier of genome engineering with CRISPR-cas9. Science 2014;346:1258096. Ran FA, Hsu PD, Lin CY, Gootenberg JS, Konermann S, Trevino AE, et al. Double nicking by RNA-guided CRISPR cas9 for enhanced genome editing specificity. Cell 2013;154:1380-9. Shalem O, Sanjana NE, Hartenian E, Shi X, Scott DA, Mikkelson T, et al. Genome-scale CRISPR-cas9 knockout screening in human cells. Science 2014;343:84-7. Wang T, Wei JJ, Sabatini DM, Lander ES. Genetic screens in human cells using the CRISPR-cas9 system. Science 2014;343:80-4. Konermann S, Brigham MD, Trevino AE, Joung J, Abudayyeh OO, Barcena C, et al. Genome-scale transcriptional activation by an engineered CRISPR-cas9 complex. Nature 2015;517:583-8. Kleinstiver BP, Pattanayak V, Prew MS, Tsai SQ, Nguyen NT, Zheng Z, et al. High-fidelity CRISPR–Cas9 nucleases with no detectable genome-wide off-target effects. Nature 2016;529:490. Sternberg SH, Redding S, Jinek M, Greene EC, Doudna JA. DNA interrogation by the CRISPR RNA-guided endonuclease cas9. Nature 2014;507:62-7. Schwank G, Koo BK, Sasselli V, Dekkers JF, Heo I, Demircan T, et al. Functional repair of CFTR by CRISPR/Cas9 in intestinal stem cell organoids of cystic fibrosis patients. Cell Stem Cell 2013;13:653-8. Hilton IB, D'Ippolito AM, Vockley CM, Thakore PI, Crawford GE, Reddy TE, et al. Epigenome editing by a CRISPR-cas9-based acetyltransferase activates genes from promoters and enhancers. Nat Biotechnol 2015;33:510-7. Friedland AE, Tzur YB, Esvelt KM, Colaiácovo MP, Church GM, Calarco JA, et al. Heritable genome editing in C. elegans via a CRISPR-cas9 system. Nat Methods 2013;10:741-3. Platt RJ, Chen S, Zhou Y, Yim MJ, Swiech L, Kempton HR, et al. CRISPR-cas9 knockin mice for genome editing and cancer modeling. Cell 2014;159:440-55. Perez-Pinera P, Kocak DD, Vockley CM, Adler AF, Kabadi AM, Polstein LR, et al. RNA-guided gene activation by CRISPR-cas9-based transcription factors. Nat Methods 2013;10:973-6. Gratz SJ, Cummings AM, Nguyen JN, Hamm DC, Donohue LK, Harrison MM, et al. Genome engineering of Drosophila with the CRISPR RNA-guided cas9 nuclease. Genetics 2013;194:1029-35. Kleinstiver BP, Prew MS, Tsai SQ, Topkar VV, Nguyen NT, Zheng Z, et al. Engineered CRISPR-cas9 nucleases with altered PAM specificities. Nature 2015;523:481-5. Doench JG, Hartenian E, Graham DB, Tothova Z, Hegde M, Smith I, et al. Rational design of highly active sgRNAs for CRISPR-cas9-mediated gene inactivation. Nat Biotechnol 2014;32:1262-7. Wu X, Scott DA, Kriz AJ, Chiu AC, Hsu PD, Dadon DB, et al. Genome-wide binding of the CRISPR endonuclease cas9 in mammalian cells. Nat Biotechnol 2014;32:670-6. Jiang W, Zhou H, Bi H, Fromm M, Yang B, Weeks DP, et al. Demonstration of CRISPR/Cas9/sgRNA-mediated targeted gene modification in Arabidopsis, tobacco, sorghum and rice. Nucleic Acids Res 2013;41:e188. Liang P, Xu Y, Zhang X, Ding C, Huang R, Zhang Z, et al. CRISPR/Cas9-mediated gene editing in human tripronuclear zygotes. Protein Cell 2015;6:363-72. Maruyama T, Dougan SK, Truttmann MC, Bilate AM, Ingram JR, Ploegh HL, et al. Increasing the efficiency of precise genome editing with CRISPR-cas9 by inhibition of nonhomologous end joining. Nat Biotechnol 2015;33:538-42. Bassett AR, Tibbit C, Ponting CP, Liu JL. Highly efficient targeted mutagenesis of Drosophila with the CRISPR/Cas9 system. Cell Rep 2013;4:220-8. Chu VT, Weber T, Wefers B, Wurst W, Sander S, Rajewsky K, et al. Increasing the efficiency of homology-directed repair for CRISPR-cas9-induced precise gene editing in mammalian cells. Nat Biotechnol 2015;33:543-8. Shalem O, Sanjana NE, Zhang F. High-throughput functional genomics using CRISPR-cas9. Nat Rev Genet 2015;16:299-311. Shen B, Zhang W, Zhang J, Zhou J, Wang J, Chen L, et al. Efficient genome modification by CRISPR-cas9 nickase with minimal off-target effects. Nat Methods 2014;11:399-402. Cradick TJ, Fine EJ, Antico CJ, Bao G. CRISPR/Cas9 systems targeting β-globin and CCR5 genes have substantial off-target activity. Nucleic Acids Res 2013;41:9584-92. Doench JG, Fusi N, Sullender M, Hegde M, Vaimberg EW, Donovan KF, et al. Optimized sgRNA design to maximize activity and minimize off-target effects of CRISPR-cas9. Nat Biotechnol 2016;34:184-91. Zhou Y, Zhu S, Cai C, Yuan P, Li C, Huang Y, et al. High-throughput screening of a CRISPR/Cas9 library for functional genomics in human cells. Nature 2014;509:487-91. Bortesi L, Fischer R. The CRISPR/Cas9 system for plant genome editing and beyond. Biotechnol Adv 2015;33:41-52. Auer TO, Duroure K, De Cian A, Concordet JP, Del Bene F. Highly efficient CRISPR/Cas9-mediated knock-in in zebrafish by homology-independent DNA repair. Genome Res 2014;24:142-53. Lin S, Staahl BT, Alla RK, Doudna JA. Enhanced homology-directed human genome engineering by controlled timing of CRISPR/Cas9 delivery. Elife 2014;3:e04766. Long C, McAnally JR, Shelton JM, Mireault AA, Bassel-Duby R, Olson EN, et al. Prevention of muscular dystrophy in mice by CRISPR/Cas9-mediated editing of germline DNA. Science 2014;345:1184-8. Kim D, Bae S, Park J, Kim E, Kim S, Yu HR, et al. Digenome-seq: Genome-wide profiling of CRISPR-cas9 off-target effects in human cells. Nat Methods 2015;12:237-43, 1 P following 243. Swiech L, Heidenreich M, Banerjee A, Habib N, Li Y, Trombetta J, et al. In vivo interrogation of gene function in the mammalian brain using CRISPR-cas9. Nat Biotechnol 2015;33:102-6. Veres A, Gosis BS, Ding Q, Collins R, Ragavendran A, Brand H, et al. Low incidence of off-target mutations in individual CRISPR-cas9 and TALEN targeted human stem cell clones detected by whole-genome sequencing. Cell Stem Cell 2014;15:27-30. Zhang H, Zhang J, Wei P, Zhang B, Gou F, Feng Z, et al. The CRISPR/Cas9 system produces specific and homozygous targeted gene editing in rice in one generation. Plant Biotechnol J 2014;12:797-807. Wu Y, Liang D, Wang Y, Bai M, Tang W, Bao S, et al. Correction of a genetic disease in mouse via use of CRISPR-cas9. Cell Stem Cell 2013;13:659-62. Ma X, Zhang Q, Zhu Q, Liu W, Chen Y, Qiu R, et al. Arobust CRISPR/Cas9 system for convenient, high-efficiency multiplex genome editing in monocot and dicot plants. Mol Plant 2015;8:1274-84. Matano M, Date S, Shimokawa M, Takano A, Fujii M, Ohta Y, et al. Modeling colorectal cancer using CRISPR-cas9-mediated engineering of human intestinal organoids. Nat Med 2015;21:256-62. Montague TG, Cruz JM, Gagnon JA, Church GM, Valen E. CHOPCHOP: A CRISPR/Cas9 and TALEN web tool for genome editing. Nucleic Acids Res 2014;42:W401-7. Ebina H, Misawa N, Kanemura Y, Koyanagi Y. Harnessing the CRISPR/Cas9 system to disrupt latent HIV-1 provirus. Sci Rep 2013;3:2510. Maddalo D, Manchado E, Concepcion CP, Bonetti C, Vidigal JA, Han YC, et al. In vivo engineering of oncogenic chromosomal rearrangements with the CRISPR/Cas9 system. Nature 2014;516:423-7. Lin Y, Cradick TJ, Brown MT, Deshmukh H, Ranjan P, Sarode N, et al. CRISPR/Cas9 systems have off-target activity with insertions or deletions between target DNA and guide RNA sequences. Nucleic Acids Res 2014;42:7473-85. Li HL, Fujimoto N, Sasakawa N, Shirai S, Ohkame T, Sakuma T, et al. Precise correction of the dystrophin gene in Duchenne muscular dystrophy patient induced pluripotent stem cells by TALEN and CRISPR-cas9. Stem Cell Reports 2015;4:143-54. Hammond A, Galizi R, Kyrou K, Simoni A, Siniscalchi C, Katsanos D, et al. ACRISPR-cas9 gene drive system targeting female reproduction in the malaria mosquito vector Anopheles gambiae. Nat Biotechnol 2016;34:78-83. Gratz SJ, Ukken FP, Rubinstein CD, Thiede G, Donohue LK, Cummings AM, et al. Highly specific and efficient CRISPR/Cas9-catalyzed homology-directed repair in Drosophila. Genetics 2014;196:961-71. O'Connell MR, Oakes BL, Sternberg SH, East-Seletsky A, Kaplan M, Doudna JA, et al. Programmable RNA recognition and cleavage by CRISPR/Cas9. Nature 2014;516:263-6. Smith C, Gore A, Yan W, Abalde-Atristain L, Li Z, He C, et al. Whole-genome sequencing analysis reveals high specificity of CRISPR/Cas9 and TALEN-based genome editing in human iPSCs. Cell Stem Cell 2014;15:12-3. Hruscha A, Krawitz P, Rechenberg A, Heinrich V, Hecht J, Haass C, et al. Efficient CRISPR/Cas9 genome editing with low off-target effects in zebrafish. Development 2013;140:4982-7. Polstein LR, Gersbach CA. A light-inducible CRISPR-cas9 system for control of endogenous gene activation. Nat Chem Biol 2015;11:198-200. Ellegaard O, Wallin JA. The bibliometric analysis of scholarly production: How great is the impact? Scientometrics 2015;105:1809-31. Sapranauskas R, Gasiunas G, Fremaux C, Barrangou R, Horvath P, Siksnys V, et al. The Streptococcus thermophilus CRISPR/Cas system provides immunity in Escherichia Coli. Nucleic Acids Res 2011;39:9275-82. Hsu PD, Scott DA, Weinstein JA, Ran FA, Konermann S, Agarwala V, et al. DNA targeting specificity of RNA-guided cas9 nucleases. Nat Biotechnol 2013;31:827-32. Wang H, Yang H, Shivalila CS, Dawlaty MM, Cheng AW, Zhang F, et al. One-step generation of mice carrying mutations in multiple genes by CRISPR/Cas-mediated genome engineering. Cell 2013;153:910-8. Li D, Qiu Z, Shao Y, Chen Y, Guan Y, Liu M, et al. Heritable gene targeting in the mouse and rat using a CRISPR-cas system. Nat Biotechnol 2013;31:681-3. Jao LE, Wente SR, Chen W. Efficient multiplex biallelic zebrafish genome editing using a CRISPR nuclease system. Proc Natl Acad Sci U S A 2013;110:13904-9. Nakayama T, Fish MB, Fisher M, Oomen-Hajagos J, Thomsen GH, Grainger RM, et al. Simple and efficient CRISPR/Cas9-mediated targeted mutagenesis in Xenopus tropicalis. Genesis 2013;51:835-43. Maddalo D, Manchado E, Concepcion CP, Bonetti C, Vidigal JA, Han YC, et al.In vivo engineering of oncogenic chromosomal rearrangements with the CRISPR/Cas9 system. Nature 2014;516:423-7. Rideau Y, Rideau F. Muscular dystrophy, incurability, eugenics. Acta Myol 2007;26:22-32. Ramalho AS, Beck S, Meyer M, Penque D, Cutting GR, Amaral MD, et al. Five percent of normal cystic fibrosis transmembrane conductance regulator mRNA ameliorates the severity of pulmonary disease in cystic fibrosis. Am J Respir Cell Mol Biol 2002;27:619-27.